Right to Education? Govt closes down Rann Shala schools in Gujarat's Santalpur area because of "lack of funds"
This week the Gujarat government may claim to be celebrating the quality education monitoring programme called Gunotsav across the state. However, ironically, this has coincided with government-sponsored schools, called Rann Shalas, of Santalpur area in the Little Rann of Kutch (LRK), being shut down. Reason: They don't have any sanction for running the schools. The Rann Shala programme was started under the Sarva Shiksha Abhiyan (SSA) for the children of traditional salt farmers of LRK. Under the programme, children would be taught in tent schools at workplace. For past many years more than 300 children in the Santalpur area of LRK in Patan district continued their education post-September, once their parents migrated to LRK for farming salt. However, SSA faced a major hurdle: It wasn't not given adequate budget to run these schools, thus leaving children deprived of midday meal and full time teacher. 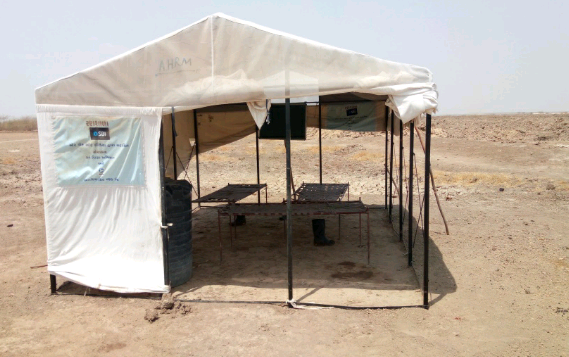 The Agariya Heet Rakshak Manch (AHRM), Gujarat's well-known NGO which works among saltpan workers, supported by State Bank of India (SBI), allotted tents this year, realising the fund constraint of SSA, a Central government programme, for having safe tents. However, the government surprisingly did not sanction any funds to the Rann Shalas. Even earlier, the sanction would be given for two months, which would be extended following repeated complaints. “Our schools have been closed down for the last one-and-a-half months. The only reason is that children were denied midday meal or even snacks this year. This resulted into heavy dropout of children. We closed it down after February 15", said a community teacher, identified as baldost, or friend of children, in the Santalppur Rann. When inquired with Cluster and Block Resource Co-ordinators (CRCs and BRCs), they seemed to be least concerned about what is happening with the Rann Shalas. “We have our visit report complete. As we did not have permission to run tent schools after March 31, we closed them down. Children should come to their native villages on their own if they want to give examinations”, an official replied casually. "When the salt season is not yet over, how could they close down the school by giving administrative reasons? This is the most insensitive act of the government. With no teacher, no midday meal, and now no school, we would like to invite the Gunotsav team to visit the Rann in Santalpur and access children's learning quality/ability", said an AHRM representative, adding, "AHRM has been persuading this issue since long, but the government every time comes up with some adhoc planning and budget..."
Under the SSA programme, according to AHRM activists, officials shed their responsibility by saying that the state neither gives them permission for full term from September to April, nor does it give sufficient budget to have midday meal or even breakfast, water facility, sports kits etc. The basic question being posed is: Who is responsible for giving full time school to the Rann's children as required by the Right to Education (RTE)? "This is a violation of the fundamental right of children, and also violation of the Supreme Court order, leading to contempt of the apex court, wherein the Gujarat government had assured that it would provide education to the children in the desert,” says Harinesh Pandya, an AHRM trustee. “We need to have comprehensive planning for education in the Rann. Rann Shalas need to be considered as extension of village schools. Teachers need to be allocated from peripheral villages, and midday meal needs to be arranged for these schools, as per RTE, and thr National Food Security Act", he said. "While Surendrangar and Morbi district programme education officers (DPEOs) can run desert schools till examinations, how could thr Patan DPEO cloose it down just ahead of examinations, leaving children deprived of their right to education? ", he added. Agariyas or saltpan workers are known to be migrating to LRK even before Independence. The book “Salt of the Earth” by Kapilram Vakil, as also several other documents, show that there were desert schools before Independence. Yet, 71 years later, the government of the day has shown its incapability of running fulltime desert schools. Meanwhile, complaints have been lodged with BRC, CRC and DEPO, with the hope that the government hears Agariyas' voice amidst celebration of “Gunotsav”.